Remember Real Live's Real Live Sh*t? Or Funky Child and Chief Rocka from Lords Of The Underground? It's been a while but here's new material from Marley Marl's right-hand man K-Def a.k.a. Kevin Hansford. 13 tracks deep this album is (almost) an instrumental album in the vein of Dilla's Welcome to Detroit and Pete Rock's Petestrumentals. It was released right around christmas last year on Redefinition Records. If BBE would've picked it up before it would definitely have a rightful place next to the before mentioned masterpieces in the Beat Generation series. The whole album is a keeper but here are two of our favourite tracks. First off is Supa Heath which is a reinterpretation of Heath Brother's Smiling Billy Suite pt.2 as used by Nas on One Love. Our second pick is one of the few vocal tracks entitled Night owls. It's such a classic piece of hiphop. The perfect soundtrack for a 2 A.M. drive through an empty city centre. As a bonus, here's some of K-Def's classic tracks smoothly blended on his The most underrated mixtape. 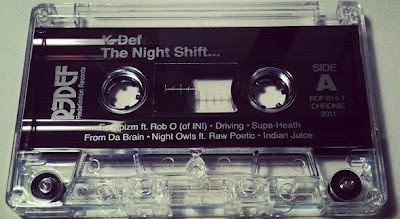 K-Def - Night Shift is available now via Fat Beats.